As much as I would love to personally visit every one of these locations, time and resources don’t allow me to do so. This guide is a blend of personal recommendations and a curated list based on in-depth research and recommendations from locals. I want it to be clear which is which, as I would never want to recommend something I haven’t had personal experience with, so all of the items marked with an asterisk* are ones that I have visited. If it’s not marked with an asterisk, it’s something that I think is worth including but haven’t visited myself. The info provided here is a starting place for your planning and research—make sure to visit the website or call a location to find out about hours, fees, reservations, and other details. If you asked the average person in the U.S. to describe what they imagine Maine to be like, they’d probably paint you a picture of the iconic rocky coastline, quaint coastal villages, and lobster shacks. And Maine has a little loads of that, for sure. 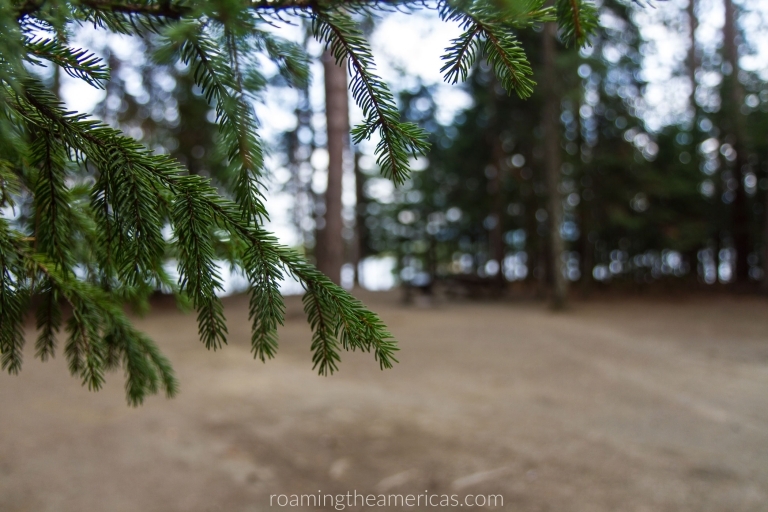 But if you asked me to describe Maine, I’d tell you about camping in the deep woods, hiking Maine’s high peaks, snowmobiling from town to town, summer days spent at the lake, or rafting on the Kennebec River. And if you asked me to list my top 10 favorite places in Maine, one or two places on the coast might make the cut. Maybe. I’m a mountains, lakes, and waterfalls girl through and through, and for me, inland Maine is what feels most Maine. Western Maine is a little more rough and tumble. There are more bugs. There’s hardly any cell service. But it’s definitely off the beaten tourist track. So if you want to get away from the crowds on the coast and you love beautiful places, this guide is for you. Geographically, Maine is pretty big. And traveling by car will make it seem huge because there’s pretty much just one interstate. The rest is made up of back roads, so it can take a long time to drive from place to place. Especially if you get stuck behind a logging truck. So I’ve divided up these upcoming travel guides roughly to cover western Maine, central Maine, and Downeast Maine. In the western Maine guide, I’m covering the Maine Lakes and Mountains Region and the Kennebec Valley (view PDF map). Even this portion of Maine is pretty big, so some of the places listed in this travel guide will be quite far from each other–you won’t be able to do them all in one trip, for sure. Coos Canyon Campground* is a fairly quiet spot with a nice location right next to the popular swimming hole at Coos Canyon on the Swift River. It’s small and not as smoothly operated as other campgrounds I’ve been to, but there are sites that are almost waterfront–fall asleep to the sound of the river–and the location is convenient to a lot of other waterfalls and scenic locations in western Maine. If you plan to stay closer to the New Hampshire border, Grafton Notch Campground is located in a gorgeous area near Grafton Notch State Park* and the White Mountain National Forest*. It’s a small campground, is dog-friendly, and has excellent reviews on TripAdvisor. Want to enjoy a quintessential Maine summer experience? Rent a camp (translation: cabin, cottage, or summer home on a lake). Most Mainers I know (myself included) have passed many a summer day “uptah camp”–boating, skiing, swimming, skipping rocks. Some camps are accessible during the winter and heated, so they’re another option for winter vacations. If you can’t find a family to adopt you and invite you to their camp, you can start here for rentals in Maine Western Lakes and Mountains and here for the Kennebec Valley. Another option for varying budgets and levels of comfort is booking a room, house, or camp on Airbnb*. Search Fryeburg or Bethel if you’d like to stay closer to the White Mountains and New Hampshire border. Rangeley and Kingfield are located a bit farther inland in the heart of Maine’s lakes and mountains, and they offer quite a few listings. Want to find a rental that’s close to the Kennebec River for whitewater rafting? Choices are a bit more limited, but search The Forks, Maine for a few options. For those looking for a bit more comfort, Maine has plenty of inns and bed and breakfasts. The Oxford House Inn & Restaurant is located in Fryeburg near the New Hampshire border. The owners have made Maine their home for almost a decade, and they source many of their restaurant ingredients from farms just down the road. Maple Bed and Breakfast** is an environmental leader in Maine, utilizing solar and wind energy, among many other eco-friendly practices. Situated on 130 acres of woods and fields, this beautiful B&B has farm animals and walking trails, along with comfort and convenience that you’d expect from any hotel. Located in the Augusta area, it’s a convenient jumping off point for many adventures in western Maine. Looking for more places to stay in western Maine? Find the best deal, compare prices, and read reviews from other travelers at TripAdvisor. Search bed & breakfasts in Maine’s western lakes and mountains at bedandbreakfast.com. I’ve found that uncovering farm-to-table dining options in rural areas is a bit more challenging than in urban or touristy areas. It’s not that restaurants don’t buy locally, but it takes more digging to find them because it’s simply a way of life and not a marketing strategy. In addition to restaurants using locally-sourced or organic ingredients, I’m also including a few restaurants that are popular with locals. The Little Red Hen Diner & Bakery* in Andover is as cute as the name implies. Stop by for a home-cooked breakfast, and you might find locals, AT thru hikers, or others just passing through. Savor some good coffee and enjoy the only Wifi spot for many miles in the middle of western Maine’s lakes and mountains. But you might want to just turn off the phone and enjoy the company of friends or family you’re traveling with. Check out Calzolaio Pasta Co. in Wilton for an Italian lunch of homemade pasta, sauces, local ingredients, and fresh Maine seafood. If you’re looking for a classic diner feel, check out the acclaimed A1 Diner in Gardiner. They serve diner fare made with some local ingredients. They’ve had press in Yankee and Down East magazines, and have even been featured on Diners, Drive-Ins and Dives. Not only has The Red Barn been serving up homestyle food in the Augusta area for almost 40 years, they are incredibly invested in their local community through hosting regular fundraisers for non-profits. Over the last 6 years, they have raised nearly $2,000,000 for non-profits and people in need. Heading farther into the heart of Maine, check out Looney Moose Café or Thompson’s Restaurant for popular local spots that serve homestyle cooking. The Oxford House Inn & Restaurant offers a seasonal menu with many ingredients sourced from farms just down the road. Enjoy a stunning view of the White Mountains from one of several dining rooms. The menu at 76 Pleasant Street in Norway also reflects the changing seasons and local flavors. Slates Restaurant and Bakery has been a mainstay in the Augusta area for over 30 years. The seasonal, local menu isn’t the only place you’ll see creativity in this restaurant–Slates also showcases rotating art shows and a Monday night concert series. The owners of Coplin Dinner House in Stratton serve what they refer to simply as “real food“–fresh, local, and sustainable whenever possible. They also create signature cocktails and serve local Maine beers. When you’re in the Rangeley area, check out Forks in the Air Mountain Bistro or Loon Lodge for fresh, local ingredients from Maine. Looking for the freshest of the fresh? At The Sedgley Place near Lewiston, owners Paul and Sue get most of their produce from their own organic farm. And Riverside Farm near Waterville is a family business that started as a simple roadside stand selling produce from their farm, and has evolved into a market and restaurant serving up seasonally inspired dishes. In the mood for drinks? Enjoy a wine tasting during summer months with wine and spirits made from Maine products at Tree Spirits near Waterville. “At Tree Spirits we know the people who grow the fruit, press the cider, and tap the trees for our wines.” And while craft beer may be a recent trend in many places, the folks at Northern Outdoors have been in the microbrewery business for almost 20 years. You’ll want to enjoy from-scratch, local food at the restaurant while you’re there, too. And if you really want to experience craft beer in Maine, take a look at the Maine Beer Trail and grab the downloadable map here. Find the freshest ingredients for a picnic lunch or cooking at the campsite at one of the many farmers markets in the region. For more information about when and where to find farmers markets in Maine, visit the Maine Farmers Market website. You’ll find listings for Kingfield, Phillips, Farmington, Bethel, Norway, Waterville, Skowhegan, Augusta, and more. Looking for more places to eat in western Maine? Find the best deal, compare prices, and read reviews from other travelers at TripAdvisor. Western Maine is full of spectacular scenery, incredible hikes, and nationally renowned skiing. There are plenty of outdoor activities to experience year-round, as well as some interesting ways to connect with local culture. Remember the Leave No Trace principles whenever you’re enjoying creation so that we can preserve it for others to enjoy. Moxie Falls*–Take a short hike into the woods and enjoy one of the best waterfalls in Maine. Spring is a great time to go if you want to enjoy massive water flow from the melting snow. Coos Canyon*–A great little rest area on Route 17 in Byron, Coos Canyon is a popular Maine swimming hole and cliff jumping spot in the summer. Screw Auger Falls*–These falls at Grafton Notch State Park are easily accessed from the parking lot. Cool off with a little wade in the water, or just enjoy the view. Rattlesnake Flume and Pool–With their blue-green water, these falls are a hidden gem that will make you think you’re enjoying tropical waterfalls (aside from the pine trees and icy water). Smalls Falls*–Grab your bathing suit, fill your cooler, and head to Smalls Falls to spend a day enjoying one of the best swimming holes, natural waterslides, and cliff jumping in Maine. Dusk and dawn are the best times to spot them. Mid-May through July and again in the fall are the best times of year to see moose. Moose like to hang out in swampy, boggy areas, but they can be seen pretty much anywhere. They’re also great swimmers, so if you’re lucky, you might spot one in or near a body of water. A few good roads to take a drive: Route 201 from The Forks to the Canadian border, Route 4 between Phillips and Rangeley, Route 16 between Rangeley and Stratton, Route 27 between Carrabassett and Eustis. Be very careful driving the roads in this part of the state, especially at night. Because moose are so tall, you may not see the reflections from their eyes as you would deer. And they’re painfully slow-moving at times, so sometimes they just stand in the middle of the road. I’m certain that most Mainers I know have either hit a moose or know someone who has (I have 2 family members who had accidents). Don’t ever approach moose or try to chase them. Although they’re not carnivorous, they are still dangerous due to their massive size and power, and they may charge if provoked. Bull moose may be more aggressive during the fall mating season. Take a drive and enjoy the incredible scenic views in the area. 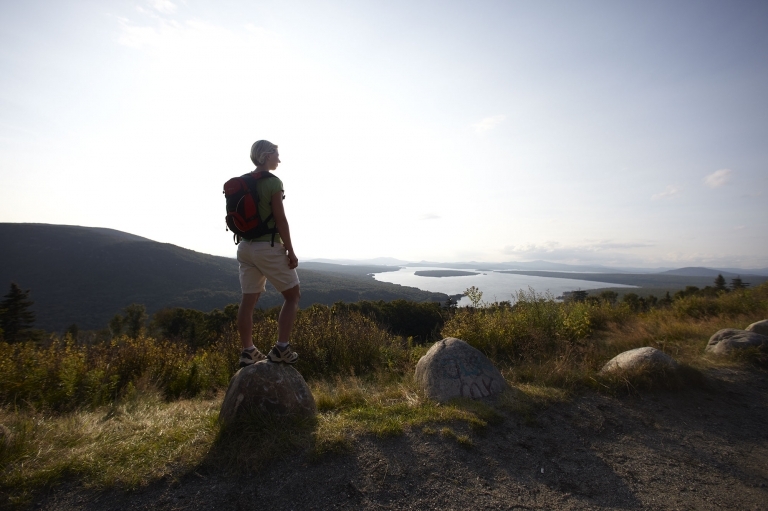 Height of Land Overlook and Quill Hill (entrance fee) are both located in the Rangeley area. Ira Mountain (entrance fee) is in Kingfield. Enjoy one of the national or state scenic byways in this region: Rangeley Lakes Scenic Byway, Route 27 Scenic Byway, or Old Canada Road National Scenic Byway. Get out into nature and enjoy some amazing hikes. Maine’s High Peaks region is home to 10 of Maine’s 14 highest peaks. The Bigelow Range is one of the most well-known, but you won’t lack in other options. There are plenty of Appalachian Trail hikes to enjoy. Find more information on AT hikes at the AT trail website and the Maine Appalachian Trail Club website. Looking for a little history and cultural insight to the area? Nowetah’s Indian Store and Museum* is a great spot to spend a few minutes or an afternoon on your way through the area. While there are interesting artifacts from indigenous peoples around the world, you’ll also find great information on Maine Indians through photos, artifacts, and just from chatting with Nowetah or her husband Tom. TIP: According to Tom, the GPS steers a lot of people wrong. Just look for the large sign on Route 27, and pull into the dirt driveway until you see the building. Heading to western Maine in the winter? With snow during about a third of the year, Mainers know how to have fun in the winter months. 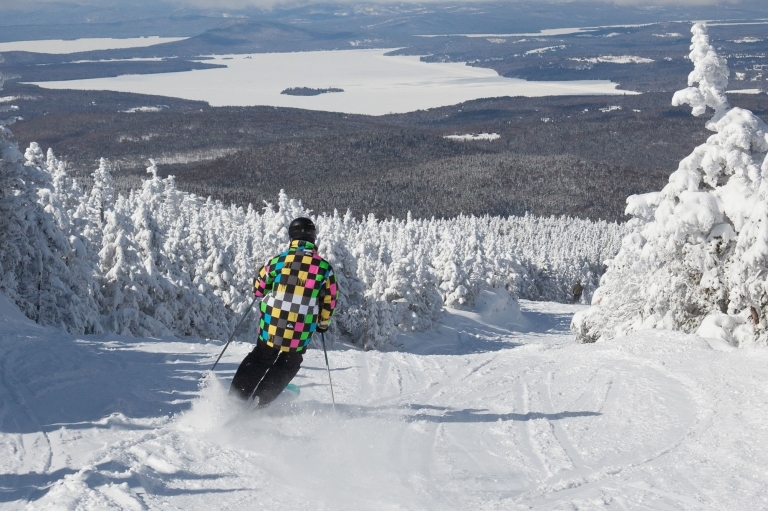 This region has the best downhill skiing in the state and some of the best in the Northeast–Sunday River in Newry and Sugarloaf in Carrabassett Valley. Or enjoy a favorite Maine winter activity by renting a snowmobile* and heading out onto thousands of miles of groomed snowmobile trails in Maine. Find rentals at Northeast Snowmobile in Fryeburg and Bethel, Sunrise Ridge in Bingham, or Northern Outdoors in The Forks. Find more information about snowmobiling in Maine and get a few snowmobiling tips here. Or head out on the trails with a pair of snowshoes or cross-country skis. Maine Huts and Trails or Sugarloaf Outdoor Center are good places to start. If you want to try outdoor activities like snowmobiling, snowshoeing, fishing, backpacking, or kayaking, but you’re nervous about going out on your own, consider hiring a registered Maine guide. I’m a big fan of not just researching things to do and places to eat, but getting to know more about a location’s history and culture (Read: 3 Reasons Everyone Should Learn History Before Traveling). One great way to do that is to read some books before and as you travel. Below are various recommendations for the practical research as well as books about Maine life or set in Maine. —Maine 101* by Nancy Griffin: this compact book is packed with interesting facts about various aspects of Maine life and history. It’s a fun way to gather Maine trivia and get the background on common and less well-known Maine facts. It has sections on Maine speak and place names, which I find especially interesting as a language nerd. —Explorer’s Guide Maine (18th Edition): As usual, the bulk of this Maine guide book covers coastal areas, but there are about 100 pages covering the Kennebec Valley and western lakes and mountains. –To read true life accounts of living deep in the woods of Maine, read A Year in the Maine Woods by Bernd Heinrich or We Took to the Woods by Louise Dickinson Rich. –For fictional tales set in rural Maine, check out The Cider House Rules or Empire Falls. —Get a DeLorme Atlas, and don’t depend on your GPS–you probably won’t have a signal. The DeLorme Atlas is one that every Mainer who ventures north of Portland keeps in his car. We had several copies in our family growing up, and we never went on adventures without one. In addition to very detailed information about roads and their conditions, you’ll find trail head locations, campgrounds, and lots of other outdoor recreation labeled in the atlas. –Only 7 digits listed in a business phone number? The area code is 207 for the entire state of Maine. –If you’re traveling in the fall hunting seasons, stay safe and make sure you wear bright clothing–preferably hunter orange–for outdoor activities (and don’t forget a bright collar or vest for your pets!). –Don’t try to fake an accent, but feel free to throw in a “wicked” here or there in place of “really.” “Wicked awesome” is one of my favorites. –Don’t refer to what you know as a cabin on a lake as a cabin, summer home, or cottage–unless you want to be pegged as an “outta-statah.” It’s a camp. It may feel weird at first, but Mainers will know exactly what you’re talking about. –If someone says, “You can’t get there from here,” it may or may not be literal. It’s just a saying in Maine about how hard it can be to get from one place to another–the punchline to an old joke from Maine humorists Bert and I (Which Way to Millinocket?). Feel free to open up this Google My Map and make a copy into your own Google account. Access it on the web or via the My Maps app (Android app | iPhone app), and you can make your own notes and itinerary in your copy! Here’s how to use Google My Maps to plan your itinerary if you’ve never used it before.